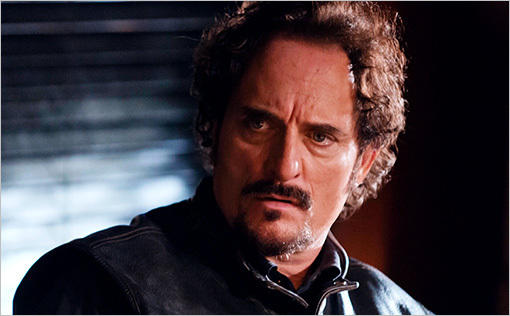 Kim Coates plays Alex ‘Tig’ Trager on Sons of Anarchy – a show filled to the brim with steeshes (like Ron Perlman who has been featured on steeshes before). He’s perfectly creepy on this show. Just last night he was drooling over a transvestite prostitute. His Wikipedia page says he has starred in the lead role of Macbeth performed at the Stratford Theatre, which is hard to imagine, but makes me respect him as an actor a bit more. You’d never know he was a good actor by watching the scene where his daughter gets fired murdered and he screams for 2 minutes straight. This entry was posted in Sons of Anarchy Steesh, TV Steesh and tagged celebrities, comedy, entertainment, Humor, kim coates, mcbeth, motorcycle, Moustache, mustache, ron perlman, sons of anarchy, stratford theatre, television, TV on October 10, 2012 by Los Bulls.